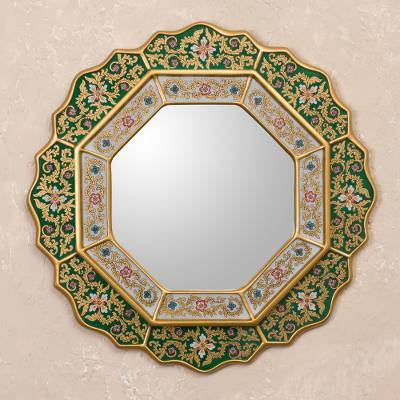 Green Floral Fair Trade Reverse Painted Glass Wall Mirror, "Green Star"
Multi-colored flowers shimmer on a deep olive green and white background in this exquisitely crafted mirror by Asunta Pelaez. With consummate craftsmanship, she creates an arresting accessory featuring delicately painted glass panels covering a wood frame. You can find reverse painted glass mirror 'Green Star' by Asunta Pelaez in wall decor categories such as Reverse Painted Glass Mirrors, Floral Mirrors, Traditional Mirrors, Glass Mirrors and Wood Mirrors. Enjoy exploring these sections for other Novica treasures. This piece is gorgeous, and very well made. Packing was superb. This was my first time ordering, and I highly recommend. Great work, all the way around.